John Lennon, founding member of The Beatles, singer, songwriter, and guitarist, was shot and killed by Mark David Chapman at the age of 40. On the night of December 8, 1980, Lennon was shot four times in the back (the fifth shot missed) in the entrance hallway of the Dakota by Mark David Chapman. Lennon had autographed a copy of Double Fantasy for Chapman earlier that same night. 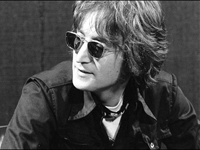 Lennon was pronounced dead on arrival in the Emergency Room at the Roosevelt Hospital at 11:15 p.m. On the following day, December 9, 1980, Ono issued a statement: “There is no funeral for John. John loved and prayed for the human race. Please pray the same for him. Love, Yoko and Sean.” Chapman pleaded guilty to second degree murder and was sentenced to 20 years to life. He is still in prison, 27 years since his arrest, having been denied parole four times. Two days after his death, Lennon’s body was cremated at Ferncliff Cemetery in Hartsdale, New York, and his ashes were kept by Ono.